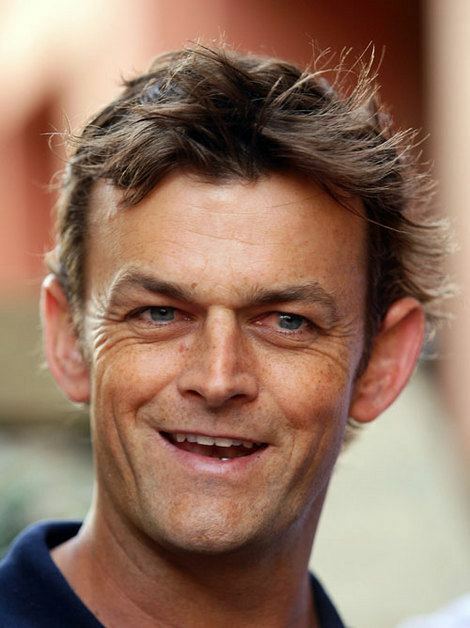 Adam Craig Gilchrist, ( born 14 November 1971), nicknamed "Gilly" or "Churchy", is a former Australian cricketer who has captained Kings XI Punjab and Middlesex. He is an attacking left-handed batsman and record-breaking wicket-keeper, who redefined the role for the Australian national team through his aggressive batting. He is considered to be one of the greatest wicket-keeper–batsmen in the history of the game. He holds the world record for the most dismissals by a wicket-keeper in One Day International (ODI) cricket and the most by an Australian in Test cricket. His strike rate is amongst the highest in the history of both ODI and Test cricket; his century against England at Perth in December 2006 is the second-fastest century in all Test cricket.He is the only player to have hit 100 sixes in Test cricket. His 17 Test and 16 ODI centuries are the most by a wicket-keeper He holds the unique record of scoring at least 50 runs in successive World Cup finals (in 1999, 2003 and 2007) and is one of only three players to have won three titles. Gilchrist is renowned for walking when he considers himself to be out, sometimes contrary to the decision of the umpire. He made his first-class debut in 1992, his first One-Day International appearance in 1996 in India and his Test debut in 1999.During his career, he played for Australia in 96 Test matches and over 270 One-day internationals. He was Australias vice-captain in both forms of the game, captaining the team when regular captains Steve Waugh and Ricky Ponting were unavailable. He retired from international cricket in March 2008. In March 2013, he announced that he would join the Caribbean Premier League, a Twenty20 tournament in the West Indies in July along with teammate Ricky Ponting. 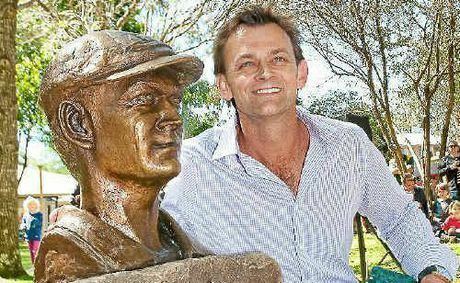 Adam Gilchrist was born in 1971 at Bellingen Hospital, in Bellingen, New South Wales, the youngest of four children. He and his family lived in Dorrigo, Junee and then Deniliquin where, playing for his school, Deniliquin South Public School, he won the Brian Taber Shield (named after New South Wales cricketer Brian Taber). 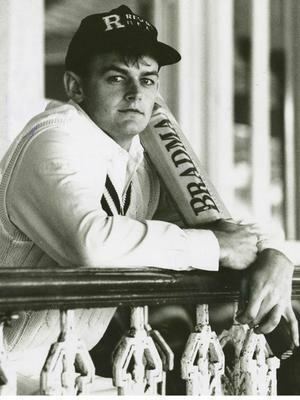 At the age of 13, his parents, Stan and June, moved the family to Lismore where Gilchrist captained the Kadina High School cricket team. Gilchrist was selected for the state under-17 team, and in 1989 he was offered a scholarship by London-based Richmond Cricket Club, a scheme he now supports himself. During his year at Richmond, he also played junior cricket for Old Actonians Cricket Clubs under 17 team, with whom he won the Middlesex League and Cup double. He moved to Sydney and joined the Gordon Club in Sydney Grade Cricket, later moving to Northern Districts. Gilchrist is married to his high school sweetheart Melinda (Mel) Gilchrist (née Sharpe), a dietitian, and they have three sons, Harrison, Archie and Ted, and a daughter, Annie Jean. His family came under the spotlight in the months leading up to the 2007 Cricket World Cup as Archies impending birth threatened his presence in the squad; Archie was born in February and Gilchrist was able to take part in the tournament. 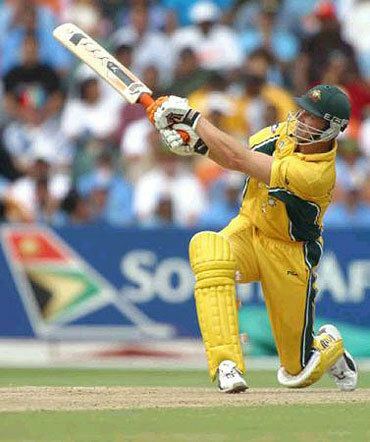 Gilchrist was called up for the Australian One Day International (ODI) team in 1996, his debut coming against South Africa at Faridabad on 25 October 1996 as the 129th Australian ODI cap,after an injury to incumbent Ian Healy. While not particularly impressive with the bat on his debut, scoring 18 before being bowled by Allan Donald, Gilchrist took his first catch as an international wicketkeeper, Hansie Cronje departing for a golden duck from the bowling of Paul Reiffel.He was run out for a duck in his only other ODI on the tour. Healy resumed his place during the 1996–97 season. Gilchrist replaced Healy for the first two ODIs in the 1997 Australian tour of South Africa, after Healy was suspended for dissent. When Healy returned Gilchrist maintained his position in the team as a specialist batsman after Mark Waugh sustained a hand injury. It was during this series that Gilchrist made his first ODI half-century, with an innings of 77 in Durban.He totalled 127 runs at 31.75 for the series. Gilchrist went on to play in the Texaco Trophy later in 1997 in the 3–0 series loss against England, scoring 53 and 33 in two innings. Fig : Celebrating a century against the World XI in the second ICC Super Series match at Telstra Dome (7 October 2005). At the start of the 1997–98 Australian season, Healy and captain Mark Taylor were omitted from the ODI squad as the Australian selectors opted for Gilchrist and Michael di Venuto. Gilchrists elevation was made possible by a change in policy by selectors, who announced that selection for ODI and Test teams would be separate, with Test and ODI specialists selected accordingly, while Healy remained the preferred Test wicket-keeper. This came after Australia failed to qualify for the previous seasons ODI triangular series final for the first time in 17 years. The new team was initially unconvincing, losing all four round robin matches against South Africa in the 1997–98 Carlton & United Series,with multiple players filling Taylors role as Mark Waughs opening partner without success. Gilchrist also struggled batting in the lower order at number seven, the conventional wicket-keepers batting position, scoring 148 runs at 24.66 in the eight qualifying matches. In the first final against South Africa at the Melbourne Cricket Ground Gilchrist was selected as Waughs opening partner. In a particularly poor start to the new combination, Waugh was run out after a mix-up with Gilchrist. 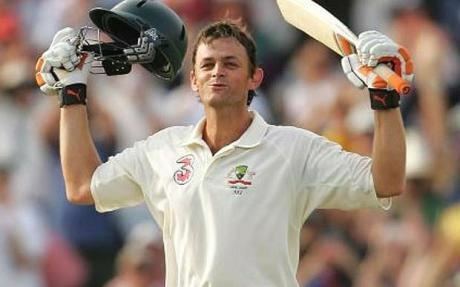 However, in the second final, Gilchrist struck his maiden ODI century, spearheading Australias successful run chase at the Sydney Cricket Ground, securing his position as an opening batsman. Australia won the third final to claim the title. Touring New Zealand in February 1998, Gilchrist topped that Australia averages with 200 runs at 50.00, including a match-winning 118 in the first match. He also effected his first ODI stumping, the wicket of Nathan Astle in the Second ODI in Wellington. Australia then played two triangular tournaments in Asia. Gilchrist struggled in India, scoring 86 runs at 17.20. He went on to play in the Coca Cola Cup in Sharjah in April 1998, a triangular tournament between Australia, India and New Zealand. Australia finished runners-up in the tournament, with Gilchrist taking nine dismissals as wicketkeeper and averaging 37.13 with the bat. Gilchrist was in fine form ahead of the 1999 Cricket World Cup with a productive individual performance in the Carlton & United Series in January and February 1999 against Sri Lanka and England. He finished with 525 runs at a batting average of 43.75 with two centuries—both against Sri Lanka—and a fifty, and a total of 27 dismissals in 12 matches. His 131 helped Australia set a successful run-chase at the SCG, and he followed this with 154 at the MCG. The 1999 tour of the West Indies was Australias last campaign before the World Cup and continued to prove Gilchrists ability as a wicketkeeper-batsman. Gilchrist, with a batting average of 28.71 and a strike rate of nearly 90.00, and seven fielding dismissals in a seven-match series which ended 3–3 with one tie. Gilchrist played in every match of Australias successful World Cup campaign, but struggled at first, with scores of 6, 14 and 0 in the first three matches against Scotland, New Zealand and Pakistan. Australia lost the latter two matches and had to avoid defeat for six consecutive matches to reach the final. Gilchrists quick-fire 63 runs in 39 balls against Bangladesh helped the Australians into the Super Six stage of the tournament, which was secured with a win over the West Indies, although Gilchrist made only 21. Gilchrist continued to struggle in the Super Six phase, scoring 31, 10 and 5 against India, Zimbabwe and South Africa. Australia won all three matches,the last in the final over, to scrape into the semifinals. Gilchrist made only 20 in the semifinal against South Africa, but completed the final act of the match. 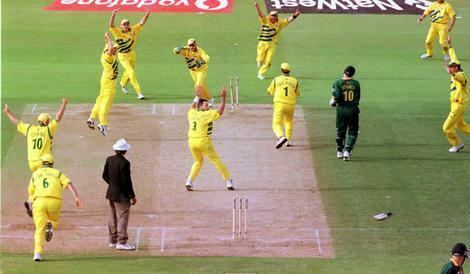 With the scores tied, South Africa were going for the winning run when Gilchrist broke the stumps to complete the run out of Allan Donald; the match was tied, and Australia proceeded to the final due to a higher net run rate. Gilchrists 54 in the final helped secure Australias first world title since 1987 with an eight wicket victory over Pakistan. It was a happy ending for Gilchrist, who had struggled through the tournament, with 237 runs at 21.54. Success at the World Cup was followed by a defeat by Sri Lanka in the final of the Aiwa Cup in August 1999,despite Gilchrist being the most successful batsman and wicket-keeper of the tournament,with 231 runs at 46.20. While the Test players battled against Sri Lanka, Gilchrist led Australia A in a limited overs series against India A in Los Angeles. He then scored 60 runs at 20.00 as the Australians completed a 3–0 whitewash of Zimbabwe in October. Gilchrist made his Test match debut in the First Test against Pakistan at the Gabba in Brisbane in November 1999 becoming the 381st Australian Test cricketer. He replaced Healy, who was dropped after a run of poor form, despite the incumbents entreaties to the selectors to allow him a farewell game in front of his home crowd. Gilchrists entry into the Test arena coincided with a dramatic rise in Australias fortunes.Up to this point, they had played eight Tests in 1999, winning and losing three. Gilchrists icy reception at the Gabba did not faze him; he took five catches, stumped Azhar Mahmood off Shane Warnes bowling and scored a rapid 81, mostly in partnership with ODI partner Waugh, in a match that Australia won comfortably by ten wickets. In his second Test match he made an unbeaten 149 to help guide Australia to victory in a game that looked well beyond their reach. Australia were struggling at 5/126 in pursuit of 369 for victory as he joined his Western Australian team-mate, Justin Langer, but the pair put on a record-breaking partnership of 238 to seal an Australian win. Gilchrist continued his strong run throughout his debut Test season, and ended the summer with 485 runs at 69.28 in six matches, three each against Pakistan and India, adding two fifties against the latter. Gilchrist played in all but one of the matches in Australias successful defence of their World Cup title; he was rested for the group match against the Netherlands. He finished the tournament with 408 runs at an average of 40.80 at a strike rate of 105. He scored four half-centuries, and was run out against Sri Lanka in the Super Six stage just a single run short of a century. In the semi-final, he scored 22 before being caught off an inside-edge onto pad off the bowling of Aravinda de Silva. The umpire gave no reaction, however Gilchrist walked off the pitch after a moments pause. In 2009 it was described as an "astonishing moment" drawing criticism from Englands Angus Fraser, who "objected to him being canonised simply for not cheating", and from others who "thought that he walked almost by accident; that having played his shot he overbalanced in the direction of the pavilion." His actions nevertheless drew praise from the majority. In the final, India elected to field first and Gilchrist hammered 57 from 48 balls, featuring in a century opening stand with Hayden to seize the initiative. This laid the foundation for Australias 2/359 and a crushing 125-run win, ending an unbeaten campaign. 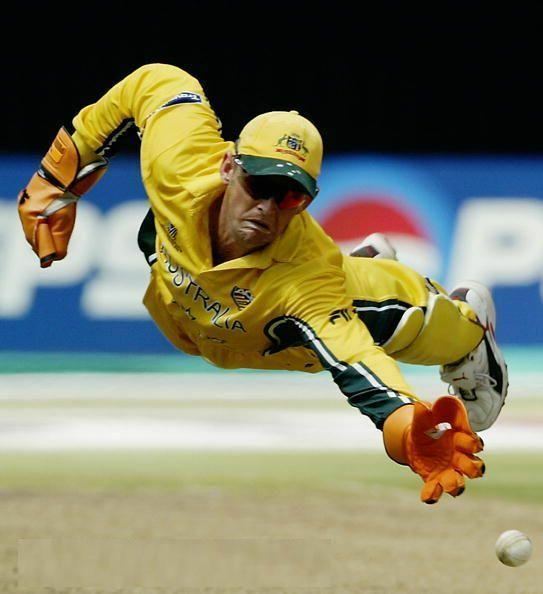 Gilchrist was also the competitions most successful wicketkeeper, making 21 dismissals. Gilchrist and Australia started their 2007 World Cup campaign successfully, winning all three of their matches in Group A, against Scotland, the Netherlands and South Africa. Australia won all six of their matches in the Super8 stage with little difficulty—the margins of victory were exceeded 80 runs or six wickets in every instance. They topped the table and thus qualifying for a semi-final rematch against fourth-placed South Africa. Gilchrist opened the Australian batting in each match, taking a pinch-hitting role in the opening powerplays. Initially successful in the group matches, scoring 46, 57 and 42, he failed in the first Super8 match against West Indies (7), but bounced back to score a second half-century (59 not out) in a ten-wicket victory against Bangladesh in a match drastically shortened due to rain. After a run of middling scores, he failed again in the final Super8 match against New Zealand. As a batsman, Gilchrist was dismissed for a single run in the semi-final against South Africa, despite which Australia won by seven wickets. As wicket-keeper, however, he took four catches, equalling the most dismissals in one match in the tournament and bringing his total for the tournament to 14, second behind Sri Lankas Kumar Sangakkara. Gilchrist opened the batting against Sri Lanka in the final. This was Gilchrists third successive World Cup final, and the third time he scored at least a 50 runs in World Cup finals and the only century hed ever scored in a world cup match. Gilchrist went on to score 149 runs off 104 balls with thirteen fours and eight sixes, the highest individual score in a World Cup final, eclipsing his captain Ricky Pontings score of 140 in the 2003 final. Australia won and he was named the man of the match. Subsequently there has been some controversy over Gilchrists use of a squash ball inside his glove during this innings. The MCC stated that Gilchrist had not acted against the laws or the spirit of the game, since there is no restriction against the external or internal form of batting gloves. In September 2007, Gilchrist played in the inaugural World Twenty20. He scored 169 runs at 33.80 as Australia were knocked out by India in the semifinals. Gilchrist then scored 208 runs at 34.66 as Australia took an away ODI series against India 4–2. In November, Gilchrists peers voted him the greatest Australian ODI cricketer ever, for which he was awarded an honour at an ACA function before Australias second Test against Sri Lanka. He was only required to bat once in the Tests, and made 67 not out as Australia swept Sri Lanka aside 2–0. 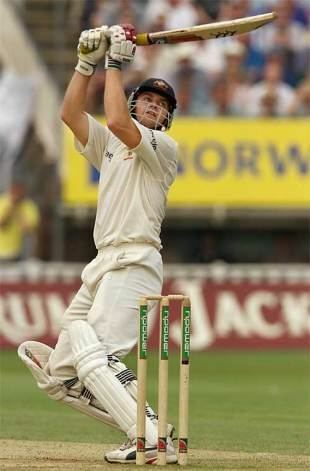 Gilchrist was one of five Wisden Cricketers of the Year for 2002, and Australias One-day International Player of the Year in 2003 and 2004. He was awarded the Allan Border Medal in 2003, and was the only Australian cricketer who was a current player at the time to have been named in "Richie Benauds Greatest XI" in 2004. He was selected in the ICC World XI for the charity series against the ACC Asian XI, 2004–05, was voted as "Worlds Scariest Batsman" in a poll of international bowlers and was named as wicket-keeper and opening batsman in Australias "greatest ever ODI team." In a poll of over ten thousand people hosted in 2007 by ESPNcricinfo, he was voted the ninth greatest all-rounder of the last one hundred years. A panel of prominent cricket writers selected him in Australias all-time best XI for ESPNcricinfo. 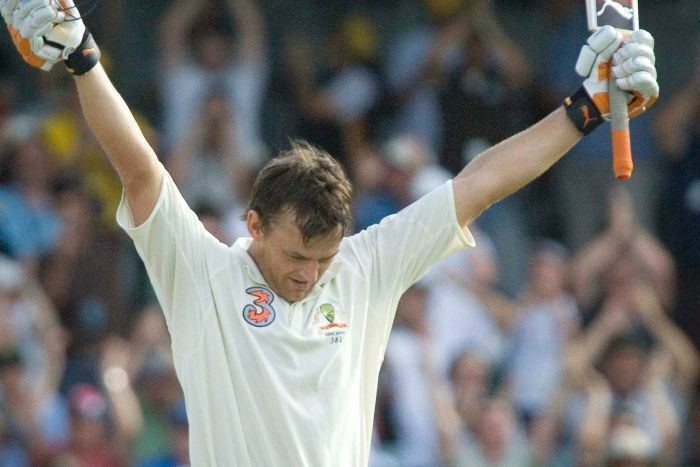 Gilchrist has not only left his mark on Australian cricket but the whole cricketing world. In 2010, Gilchrist was made a Member of the Order of Australia for his services to cricket and the community. He was inducted into the Sport Australia Hall of Fame in 2012. On 9-December-2013, ICC announced that they had inducted Gilchrist in the prestigious ICC Hall of Fame. •	Gilchrists best Test batting score of 204 not out was made against South Africa, Johannesburg, 2001–2002. •	He has captained Australia in six Tests: four wins, one loss, one draw. •	Holder of the record for most sixes in a Test career, with 100 sixes. •	Holder of second fastest Test Hundred (100 in 57 deliveries) vs England, 16 December 2006. •	Holder of the second most Test dismissals by a wicketkeeper (416), 4 February 2008. •	Holder of most Test centuries by a wicketkeeper (17), 4 February 2008. •	Holder of most ODI dismissals by a wicketkeeper (472), as of 4 November 2011. •	Gilchrists best ODI batting score of 172 was made against Zimbabwe, Hobart, 2003–04. •	He has captained Australia in 15 ODIs: 11 wins, 4 losses. •	Holder for record of second fastest ODI century by an Australian (100 from 67 deliveries against Sri Lanka on 14 February 2006).